EVA uses natural language processing and machine learning to automate on-the-go clinical workflow with athenahealth. Note Feature - brining, data query/entry, mixed with machine learning together. The patient/provider bond has been broken due to increased regulatory pressures on providers to engage in documentation and data entry during patient visits instead of directly engaging with their patients. Moreover, existing electronic medical records (EMRs) have poorly designed user-interfaces that offer providers a painfully clunky and time-wasting user experience. The increased regulatory pressures (such as Meaningful Use) on providers to document patient visits, combined with an EMR interface that was not made with the end user in mind, causes providers to spend an average of 40% of their time in front of a computer screen with over 4000 mouse clicks during a standard 10-hour shift. This manual, slow data entry/retrieval process negatively impacts multiple members of the healthcare delivery value chain. Patient satisfaction is impacted because providers have to constantly shift their attention off of the patient and onto data access/entry during the visit. Providers, who cherish the doctor-patient bond, are frustrated in their seemingly “administrative” role where almost half of their time is spent NOT engaging directly with the patient. Lastly, hospital facilities make less revenue not only because of worse patient satisfaction, but also in the opportunity cost of the time lost in physician data entry, preventing the institution from seeing more patients. We've interviewed dozens of residents, attendings, hospital executives, and mid level providers across the Boston healthcare landscape who've expressed a need for a technology that relieves the data-entry burden that doctors face; existing solutions used by providers, such as Dragon (Nuance) are primarily only used for active clinical note generation and lack significant EMR integration to easily access patient data or enter orders. Thus, our primary market research reveals a strong need for a cross-platform tool to help doctors query, interact with, and enter data into an EMR in an easy-to-use fashion. *Please refer to attached pages. EVA is a HIPAA-compliant intelligent virtual assistant that can query into any EMR to gather patient data (e.g. recent lab results), execute order entry (schedule referrals/lab tests), and facilitate passive clinical note generation. An example use case is detailed in Exhibit 1*. During a patient visit, the provider would make queries (e.g. creatinine level) in real time by speaking into their mobile device and enter necessary orders (e.g. blood panel). 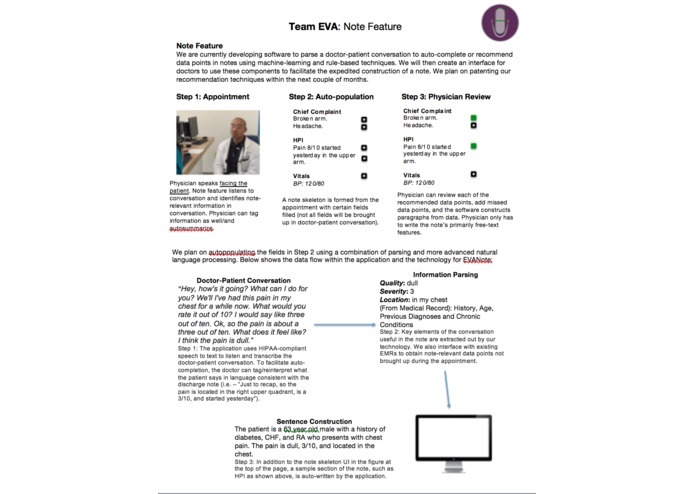 Throughout the patient visit, EVA will be listening to the provider and can fill in parts of a structured medical note using AI-based keyword identifications. This automation of speech-to-text, followed by note structuring is patent-pending and a key differentiator. The provider could then review and use the parts to quickly draft a note. EVA allows providers to spend significantly less time focused on data entry during and after the appointment, as shown in Exhibit 2*. Most importantly, EVA abstracts away the EMR during the appointment, restoring the patient–doctor bond both parties crave. Built using Dragon's API, python and athenahealths dev environtment. Identifying the perfect use case. Our team met at the MIT Grand Hack in 2015. We’ve gone on to win two more hackathons (athenahealth and BWH iHub) and now want to accelerate EVA into a viable venture. Our five-member team has a wide-range of experiences and have attended programs such as Nuts and Bolts, $100K Accelerate, and StartMIT. After dozens of interviews the primary need that we want to first address is to improve clinical workflow and note writing. Since MIT100K Accelerate, we’ve focused on product engineering, obtaining clinician feedback, and building strategic partnerships. Our goals for the next 6 months are to create MVPs of the note, query, and order features, file a patent on our technology, and conduct a pilot of our technology (Exhibit 3). Engineering: We have demoed the core functionality for the Order/Query features to panels of physicians and advisors at BWH and MGH, and having received positive feedback, seek to create an Order-Query MVP by June. We also hope to have a demo of the note feature by July of this year. Our goal is to synchronously file a patent with this demo. Market: We hope to pilot the Order and Query features in June and are currently building relationships with hospital technology leaders who could lead our pilot. Our pilot will enable us to quantify the cost/time savings and customer satisfaction from the product. Lastly, to gain more exposure and feedback for our product, we are entering the AthenaHealth Innovation Challenge and applying to accelerators like MassChallenge/BluePrint Health.